NRA Leader To Headline This Week At CPAC - Joe.My.God. The NRA is a “presenting sponsor” of CPAC 2018. 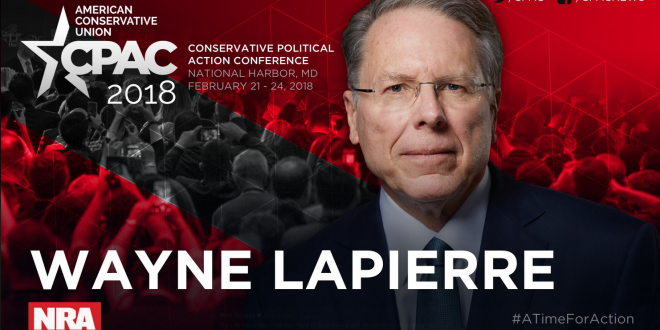 One week after 19-year-old Nikolas Cruz went on a killing rampage at his former high school in Parkland, Florida with his legally purchased AR-15 rifle, the National Rifle Association’s (NRA) CEO and Executive Vice President Wayne LaPierre will speak at the American Conservative Union’s CPAC (Conservative Political Action Conference). Other speakers include President Donald Trump, Vice President Mike Pence, and Senator Ted Cruz, among other Republican politicians who receive donations from the NRA. The CPAC will take place February 21-24 at the Gaylord National Resort & Convention Center at National Harbor, Maryland. All four men spoke at CPAC last year. The truth is the far left — they’ve turned protesting into what seems like a full-time profession. Seriously. You would think that for $1,500 a week, they would at least know what they are protesting. I mean, you’ve seen it. I mean, half of them, they can’t even tell you. But one thing is for sure, we’ve all seen just how violent they can be. The left’s message is absolutely clear. They want revenge; you’ve got to be punished. They say you are what is wrong with America, and now you’ve got to be purged. But maybe it is time these protesters took some advice from Barack Obama. The election has consequences and we won. That’s right. Folks, our long nightmare, it may not be over. The fact is, it may be just beginning. Right now, we face a gathering of forces that are willing to use violence against us. Think about it. The leftist movement in this country right now is enraged. Among them and behind them are some of the most radical political elements there are. Anarchists, Marxists, communists and the whole rest of the left-wing Socialist brigade. We’ve got 5 million active NRA members, 25 million more who consider themselves NRA members, and we have gun owners and Second Amendment supporters all over this country. So if you are a member of the leftist media or a soldier for the violent left, a violent criminal, a drug cartel gang member or a would-be terrorist, hear this: You’re not going to win and you will not defeat us. See the full list of scheduled speakers. Ugh.